Question: What is the inner work in the group between circles (Igulim) and the “straight line” (Yosher)? Answer: Before I was satisfied with success in the corporeal world, but then I suddenly felt that something was missing in my life, and I began to search for a place where I would feel better. Thanks to this sensation I have come to the science of Kabbalah, but who was it that pushed me to it? My questions are called “the desire for fulfillment” (Hissaron). I (my “point in the heart”) had existed in some “round” place and suddenly felt bad. In other words, a certain tension had emerged between me and my environment, a difference, a “delta.” I felt this delta (difference) as evil, as I was tormented by the question “What am I living for?” because I do not feel satisfied and balanced. From this sensation the Surrounding Light had already begun to influence and move me since the preservation of balance is a law of nature. The Surrounding Light is what is pushing me to a state of balance. I had begun to move and had transitioned into my next state; I began to look for answers in say mysticism, then came to some philosophy, and ultimately arrived at the center of the circle: the science of Kabbalah. So who was it that has been leading me along this entire path? 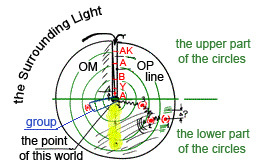 It is the Surrounding Light! I have always existed in it, only I didn’t always realize it. Thus I pass through the 1st, 2nd, 3rd, and 4th states. In the 2nd state, I was calmer with respect to the Surrounding Light because I felt less pressure than in the 1st state. But after spending some time in that state, I was influenced by the Surrounding Light and began to feel that this state is not very good. That is, I increased my sensitivity to the Surrounding Light, which caused me to feel bad again! And again I began to search. Thus I am pushed by the Light every time. In essence, I don’t do anything myself; it’s the light working on my desire, until I reach the very center. At the center is a totally unique quality called a “group.” In this point the Surrounding Light (Ohr Makif) and the Inner Light (Ohr Pnimi) cease to influence me entirely. I exist in the central point of all the “circles” (Igulim) where they do not function and also at the end of the “line” (Yosher) where it does not function. So what am I to do? And here is where I need to act independently, for I find myself at a point of free will. Presently Light does not act on me, but waits. To the extent that I can bring myself out of this state of balance, the Light will begin to influence me! I connect to the group, and all the additional desire that I receive from it elevates me! This desire pertains to the line, for I have received it from the group. When my desire falls within the line, I find myself once more under the influence of Igulim (after all, I do not yet have a screen [Masach] and do not belong to Yosher), and once more I feel a difference between myself and the circles. This leads to the Surrounding Light influencing me. It is not the general Light, but one that belongs to the Light for I have received my desire from the group, which is the line. This Surrounding Light in the line wishes to elevate me for the two of us to be in balance. Herein lies the Segula (remedy), the miraculous power of the Torah, for this light influences me and elevates me in this straight “tube.” I rise on account of the Surrounding Light, but this Light influences me to the extent that I actualize my freedom of will in the group, by connecting to it in collective study. Herein lies our entire work! Baal HaSulam explains it in the book, Beit Shaar HaKavanot, which is the foundation of all our intentions to reach bestowal. Therefore, I can only ascend “in the line” with the help of an additional force, which I receive from the group. According to the desire received from the group, the impression of the goal’s importance, the Creator’s greatness and the paltriness of my own ego, the Surrounding Light begins to influence me. What wonderful reading. Thank you very much. It seems all this has happened to me, but I had no idea of egoisim and why I kept falling back. Again, Thank you.